I suppose it was natural that we called him Vladimir Ripley. The first day we ran into him was on a snowy street in Moscow. Recognizing us for Americans, Vladimir approached and without introduction said, "Believe it or not, I have uncle in Buffalo." This was in 1943, about the time that Moscow was full of Poles. Comparatively full of Poles, that is, since the mysterious forces that have torn Poland for many centuries were rending again. General Anders' captive Polish Army was being revived from Russian prison camps after being caught in Hitler's invasion from the west and the Red Army's march-in from the east. We never did determine whether Vladimir was a Pole or a Russian or a what. I have often thought of him as the "Complete Slav," in the style of Isaac Walton's fisherman. Vladimir had the Russian soul, but it was a merry one. It was evident that he had once been with an army—whose army was questionable. Somehow, somewhere, he had received an education. With that wonderful Slavic aptitude to pick up foreign speech, Vladimir would say: "Believe or not, I speak all languages and when speak all sound like the language Vladimir." How he existed in Moscow, I don't know. He had a western-style Chesterfield coat with the most moth-eaten fur collar I have ever seen. We often suspected that he was working for the NKVD, but he did not effect the jet black, long-billed cap and stern expression of the secret police. Vladimir, incongruously, wore a Russian GI fur hat. He absolutely rejected the mark of the Soviet bureaucrat—that of wearing the right hand in the opening of the coat, Napoleon-style. All the pictures of Joseph Stalin display this gesture, and the faithful copy it almost as a a badge of office. I suspect Ripley also had no gloves. Of course, we never really got to know Vladimir in Moscow. He just seemed to have the same tastes we had. On a fine spring day, there he would be enjoying the weather in the Park of Culture and Rest. The night Lepeshinskaya was dancing Swan Lake at the Ballet, there would be Vladimir parading in the lobby making eyes at the devushkas. How he got the tickets, how he got to Moscow, no one has ever found out. I've thought about it many times, and my conclusion is that Vladimir Ripley and his "believe or not" philosophy is part of that lucky group of people in all nations who remain unaffected by wars, revolutions, weather, women, or weddings. He had the look of the old-time burlesque comedian about him—a kind of Slavic Sliding Billy Watson. His face was the color and shape of a prize ripe tomato. A couple of his teeth were missing, but the loss was made up in the brilliance of the pair of the gold teeth right in front of his face that gave him the air of an East European Bugs Bunny. His stature was on the side of the tall midgets. He could, on occasion, look like the most stern and worried member of the Russian Communist Party, but it was an act. So many attitudes in Moscow are so self-consciously acted. Vladimir became a project with us of the wartime American colony in Russia. His beaming face turning up unexpectedly in the dull, drab, depressing, and despotic background of warring Moscow was for us a rare and refreshing thing to behold. It was a strange, tip-of-your-hat, smiling relationship that probably existed only because that was the era of good feeling between the East and the West in 1943. The Red Army had just done a great and historic thing. It had licked the crack German army at Stalingrad. The Russians were feeling justly proud of themselves, as the personal communiques of Marshall Stalin himself testified. At that time, foreign correspondents of the Allied nations did not worry the Russians as we apparently do now. When I left Moscow, the last I remember seeing of Vladimir Ripley was marching on a snowy street carrying a banner expressing the factory workers' love of "Our Great Leader and Teacher, Comrade Stalin." I think it was Vladimir but, believe it or not, I don't think he ever saw the inside of a factory. It was in Berlin five years later that Vladimir Ripley again came into our lives. Of course, a lot of things happened in between. The Russians went on to exploit their Stalingrad victory to drive every last Wehrmacht soldier into their prison camps or into Germany or into the rich black soil of the motherland. 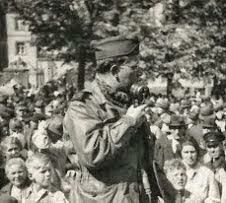 The Western Allies landed in France and joined with their Red Army colleagues on the Elbe. There was Potsdam. The atomic bomb was dropped. Working on a refugee story in Berlin one day, I stopped at a camp where hundreds of miserable men, women, and children were lined up for registration and possible shipment to the West. They weren't only Germans. They were Poles, Russians, Hungarians, Yugoslavs—a collection of all the nationalities and races of Europe sifted here through the sieve of war. Sure enough, a little man stepped out of the crowd and tapped me on the shoulder and said: "Believe or not..."
We shook hands. He smiled with his two gold front teeth, the rest of his face as red as ever. His hair was a little more sparse and grey. The lines in his face were deeper. But there seemed to be no lack of twinkle in his eyes or buoyancy in his spirit. "Tell me," Vladimir Ripley asked, "Believe or not, you still correspondent?" I assured him I was. He grinned and remarked something about "believe or not, except in America most correspondents intelligence agents." I asked him if he were correspondent, or an agent or what. What was Vladimir Ripley doing here in Berlin in a refugee center? Vladimir shrugged his shoulders and again grinned, but made no reply. I noted for the first time how he was dressed. He was wearing civilian clothing much better than when I last saw him. His ragged, fur-collared coat had been replaced by a black, double-breasted model. He even sported a battered black hat that had once been a Homburg. Now it looked like a fedora with a broken gutter. I repeated my question. "Vladimir," I demanded, "what are you doing here?" For the first time, Vladimir looked distressed. He again shrugged his shoulders. "Believe or not, Gospodin," he said, "I am the man who kill Stalin." I gave him a cigarette, which he accepted with the studied nonchalance only of a man who hadn't had a smoke in a long time and didn't want to show it. He lit the cigarette, took a deep breath and said, "Is there somewhere we talk?" I took him to a nearby bar, and for the first time I saw that Vladimir was becoming an old man. It was the first time I had ever seen him relaxed. "Believe or not," he repeated softly, "I am here in American sector Berlin only because I kill Joseph Stalin." We had schnapps and he began to revive. We had another one or two and he was soon back to his sparkling self. He spotted a copy of the American-licensed newspaper in Berlin, Neue Zeitung. He asked if he could have it. To my surprise, he tore the newspaper in half and folded it into a pair of rectangles. Then, taking off his shoes, he inserted the newspaper in them to cover the holes in the soles. "This paper is much harder texture than Pravda," Vladimir smiled. "I am conducting experiment whether Pravda or American paper lasts longest." The mention of Pravda seemed to stimulate him as much as the schnapps. "You ask why I am here. I remember you from Moscow so I will tell you. The reason you see me so much in Moscow is that I work for the propaganda in foreign office." I remember the mysterious work of the Russian propaganda ministry. It was part of the foreign office. They even controlled the news censorship. We could protest cuts in our stories as far up as Molotov, but it didn't do any good. That was the propaganda setup. The workings of the propaganda branch of this ministry was a complete mystery to us. We didn't know who prepared the communiques or who formulated the basis of propaganda policy. We still don't. All decisions had to be approved by the Politburo, of course, but there must have been a large staff of experts with foreign experience who thought up the original ideas. There were too many of them to come even from Comrade Stalin. So, it looked like Vladimir Ripley was one of the men behind the scenes. He grinned and continued: "It was good life I have in Moscow. I was not too high in government. Not too low. I often dream of the ballet." I thought I was in for a session of remorse, of recrimination and a confession of what we came to know as the soul of Mother Russia. But Vladimir was made of more volatile stuff. "Believe or not," he said, "in many ways is great joke. I kill Stalin! Ho!" He broke into a fit of suppressed giggles. He began talking. "You remember when Politburo decided Stalin was to be the great general, the great military strategist, the originator of victorious strategy? Stalin became generalissimo, supreme field marshal commander who would rank with Kutusov and Peter the Great." I told him I remembered. "Reason for this," he continued, "Politburo knew our generals and commanders in field would have to have much powers. Maybe dangerous powers. So Stalin became military man as well as political man." Vladimir paused and grinned. "Of course, we had political commissars attached to every unit make sure any deviationists be reported and punished. But even brilliant renegade Polish General Rokossovsky was brought out of house arrest so he could fight the fascist beasts." He broke his story here to ask for another schnapps. "Believe or not, it was I who had part of job to glorify Generalissimo Stalin in the great peoples' struggle against the Nazi wolves who invaded the homeland," Vladimir whispered. He wasn't smiling now. He meant it. Then he grinned and looked up. "But then I make my mistake. It was after capture of Berlin, after Potsdam. We work hard on Potsdam. I go back to Moscow. There I make my mistake." I was getting a little itchy about this. "For God's sake! Speak up. What mistake?" "Well, believe or not, I am shifted to foreign office Far East section. After we defeat Germans we want defeat Japanese, particularly those Japanese in China. We have great plans for China," Vladimir said. "I did good. I work hard. I do much research. I follow the pattern. When we win in Stalingrad, Stalin is there and we have victory. But he not really there, understand, except in my typewriter." I nodded and he declared: "It was same at Kiev and Kharkov and Poltava. Stalin is there on my typewriter." He scratched his head. 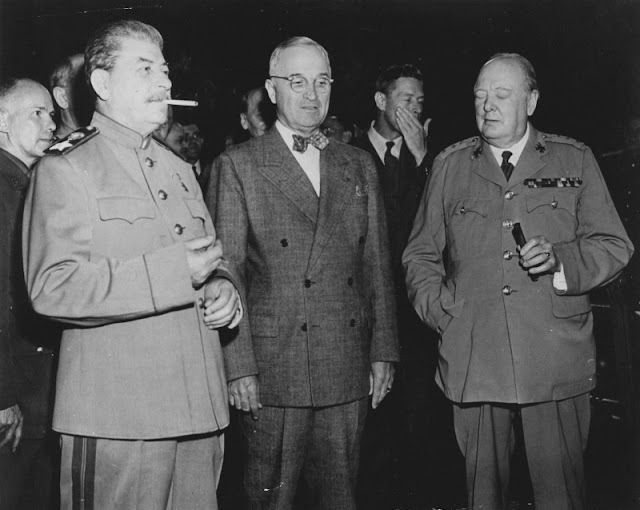 "Believe or not, we never did get Stalin into Berlin before Potsdam Conference. I hope no one thinks of that in foreign office." We had another schnapps and Vladimir was obviously feeling them. "So I tell you how I kill Stalin. In my research on Japan, it reasonable that the Generalissimo Comrade Stalin should make an appearance before Japanese workers and they declare they ready to give up war and join in search of Peoples' Democracies for Peace under Marx, Lenin, and Stalin. We do it before, in my typewriter, of course." He finished his drink and started buttoning his coat. "Believe or not, I make very good research and report this. I write story. It goes upstairs to the big boys. That's why I here in refugee center." In desperation I asked: "What exactly did you do?" "Believe or not," Vladimir grinned, "I write story of Stalin visitation to workers of Hiroshima on August 6, 1945. Believe or not, that's the day Americans drop atomic bomb."